HUNTINGTON, NY, NOVEMBER 2015 – For its fifth consecutive year, Island Tasting will showcase the culinary talents of more than 25 top local restaurants by serving up their signature dish for a food sampling extravaganza. All funds raised will benefit Island Harvest Food Bank, a leading Long Island hunger relief organization. This event will take place at the historic Coindre Hall, an original gold coast mansion. More than 350 guests are expected to sample the cuisine, enjoy live music and sip cocktails. The highlight of the evening is the diverse silent auction, including fine jewelry, leather goods and a luxury getaway to Emerson Resort in the Catskills. 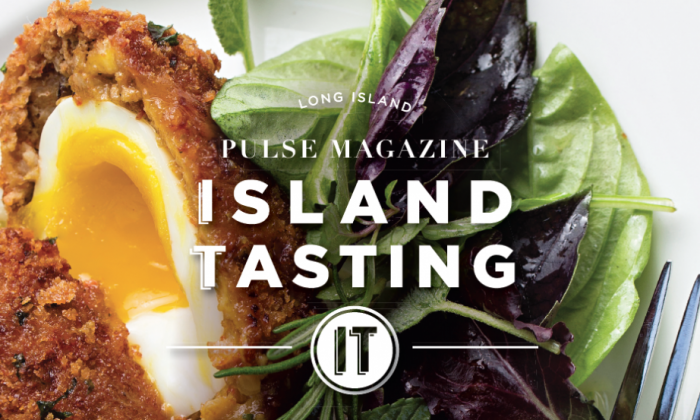 Island Tasting is held in celebration of the release of Long Island Pulse Magazine’s November Food, Wine & Spirits issue. Last year the event raised enough money for Island Harvest Food Bank to purchase 13,250 pounds of food, or the equivalent of 11,042 meals. Tickets can be purchased online at lipulse.com/party and at the door for $30 each. The event takes place on November 12th from 5:30-8:30pm. Participants to date include: Babylon Carriage House, Brewology 295, Barrique Kitchen & Wine, Bobbique, Boca Kitchen & Wine Bar, Cabo “A Taste of Mexico”, Casa Del Campo, Château Lestage, EB Elliot’s, Finca La Igriega, The Frisky Oyster, Infuse Tea Bar, Lenz Winery, The Melting Pot, Mirabelle Restaurant & Tavern, Parlor House Grill, The Petulant Wino, Public House 49, Raphael, Sangria 71, Seasons 52, Shandon Court, Spuntino Wine Bar, Swallow, Tocolo Cantina, The Trattoria, Verde Kitchen + Cocktails and Verde Wine Bar. Auction sponsors include: Celebrity Cruises, Devotion Diamonds, Excel Aire, Marotta Facial Plastics, TSC Direct and MTN Matchmaking. Lessing’s, which operates Coindre Hall, is the host sponsor and Event Kings will manage the event. Island Harvest Food Bank is a leading hunger-relief organization that provides food and other resources to people in need. Always treating those it helps with dignity and respect, its goal is to end hunger and reduce poverty on Long Island through efficient food collection and distribution; enhanced hunger-awareness and nutrition-education programs; job training; and direct services targeted at children, senior citizens, veterans and others at risk. Approximately 94 cents of every dollar donated to Island Harvest goes to programs that support more than 316,000 Long Islanders. Island Harvest is a lead agency in the region’s emergency-response preparedness for food and product distribution, and is a member of Feeding America, the nations leading domestic hunger-relief organization. More information can be found at www.islandharvest.org. Long Island Pulse Magazine is the largest magazine on Long Island, owning the Gold Coast, Hamptons and boutique communities. The magazine is read monthly by 35-55 year old affluent professionals and has an ABC audited circulation of 100,000 copies monthly, qualifying as one of the largest regional magazines in the country. For more information, visit: www.lipulse.com. For more information or interviews with publisher and editor Nada Marjanovich, contact Brittni Gorman at Brittni@nulllipulse.com or visit lipulse.com.